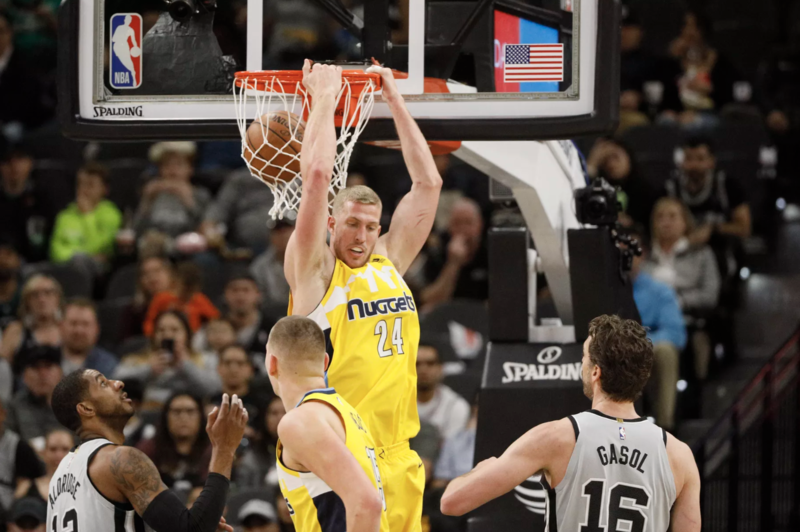 The best part of Mason Plumlee’s three-point field goal on Saturday night wasn’t the hilarious shimmy celebration that he gave as he strutted back down the court, nor was it the Pepsi Center crowd blowing the lid off of the building in pure excitement and pandemonium after the shot went in. It wasn’t that it was the first three-point make of his career. It wasn’t even the fact that the shot was a de facto back-breaker for the Utah Jazz, capping off an 11-4 start to the fourth quarter and propelling the Denver Nuggets to outscore the Jazz 35-15 in that final period of play. The best part was the bench and the crowd’s reaction the moment Plumlee rose up to take the shot. Before the ball ever left his fingertips, the Nuggets bench could feel what was about to happen. They were all pulling for him and, in a weird way, seemed to have faith that he’d knock it down. Just watch how excited everyone was before, during, and after the ball went through the net. So much of team success in this league comes down to individuals not just accepting their roles, but learning how to flourish within them. What a gift it must be for a coach and a locker room to have a player who seems to grasp that like Mason does.